Unbelievable as it seems, this is the 50th edition of my monthly e-zine, Small Layout Scrapbook! 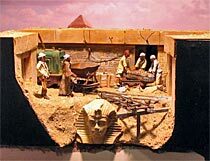 I’ve noticed online an increasing number of model-railroading blogs … digital displays, descriptions, and design details of model railroads under construction, along with the varying emotions of their builders. So I thought it might be fun this month to get personal, glance back at our 50 (or 60) pages of small layout material, and reflect on some of my own most memorable moments here since Page #1 appeared in May 2002. Your memories will probably be different, but these are the things that stick in my mind. I’m often asked, “How did you come to be an expert on small layouts?” I guess this is another way of asking, “If you’re so smart, why aren’t you on the staff of Model Railroader – or Railway Modeler – or Loco Revue – or Mittelpuffer?” Actually, aside from my intense fascination with small model railroads, my only credential is the fact that I’ve been making them for over 40 years. Issue #1 of this Scrapbook showed a murky old Polaroid photo of my very first micro layout — two square feet of HO trolley line (with working overhead wire) that I built in 1962! My second layout, a 36x9in shelf called the North Pole Railway, also appears on this site. That first issue also launched a story that has been unfolding ever since and was resolved only two months ago! 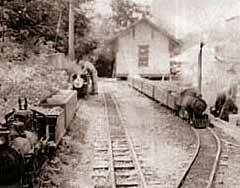 It’s the amazing tale of Murphy’s Railroad, a little live steam line that I ran across in the small town of Burton, Ohio … a delightful 12in gauge “micro” layout that I’ve been investigating since 2002! This spring, in March 2006, I finally found and met with the line’s builder and operator, Howard Murphy from Warren, Ohio USA. That meeting and Howard’s metamorphosis from steam-locomotive engineer to diesel driver are described in issue #48 — and other photos of Howard’s wonderful live-steam-operated “layout” appeared in #6 as well as #1. Read them from the beginning if you enjoy mystery stories! Increasingly I’m struck by the awesome fact that by far the world’s most popular layout design is the humble Pizza Layout … a simple circle of track on a round or square base that looks like it could fit into a square pizza box. There are dozens of examples in the Scrapbook archives — from collections of December holiday pizzas (#5) to a cornucopia of circular scenery ideas in #2, #13, #14, #17, #23, #31, #37, #43, #48, and #49. In fact, pizzas are everywhere…in the listed issues there are pizza layouts from 15 countries! I’ll bet nearly everyone reading these words has built a pizza layout at one time or another. If you haven’t, let me know, and I’ll e-mail you the layout plan. 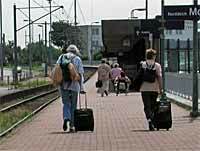 Another element that fascinates me is the amount of large-scale railroading that can be done in a very small space! Examples abound, from the convoluted G-scale pretzel in #2 to the amazing 7/8in scale Hedgehog Hill in #15 and Von Leipnik’s Interplanetary Transport Co. in #41. If you want proof that large scale trains can be operated successfully in the space of a bookshelf, check out Carl’s Exports (#27, now known as Longstowe Works) and Borracho Brewery (#22). Another way to squeeze a large scale into a tiny space is by modeling the narrow gauge … where prototype trains are small, manueuverable, and can turn through very tight radius curves. I’m proud of my part in helping to popularize Gn15 scale – modeling 1:22.5 or 1:24 trains on HO tracks that represent a very-narrow, space-saving 15in gauge. My Squarefoot Estate Railway (2001) was probably the world’s first Gn15 layout, and there have since been many others in these pages — most notably in #6, #21, #37a and #44a. Many readers will also recognize that I’m excessively fond of layouts that feature fantasy or whimsy. There are several outer space railroads in the Micro Layout Design Gallery. And the pages of this Scrapbook have featured such fun-filled layouts as Lummerland (#7 and #36), based on a children’s book; the Cat-Skills Railroad (#30), which provides a playground for the family feline; and the outrageous Valhalla Hog Express (#27) from Norway. There are many more and probably will be lots in the future. I love ‘em! Another development that interests me greatly is the emergence of new “Classic Small Layouts” — designs that are so appealing that they’re adopted and adapted by modelers around the world. 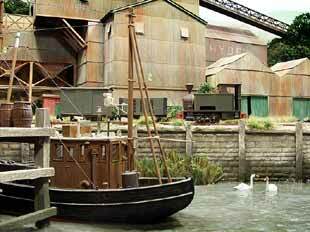 One good example is Jack Trollope’s Box Street Yard, which on this site first appeared here in the Micro Layout Design Gallery. 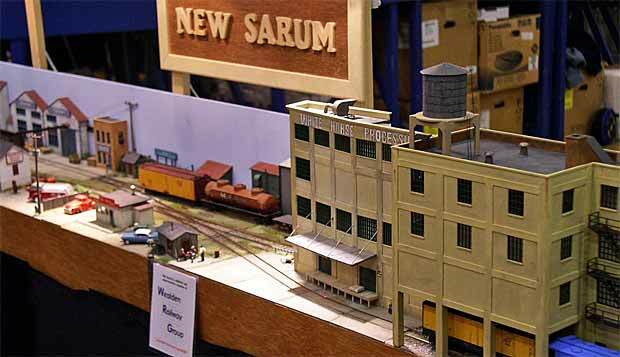 We’ve followed the development of adaptations ranging from Las Cajas Avenue (#25 and #45) and the Swiss layout, 46th Street Yard (#22 and #42a) to the nicely done New Sarum (#48). 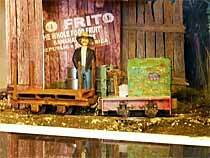 The original nine “Classic Small Layouts” were featured in #4, and Box Street Yard will be joining them. 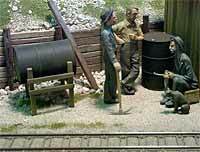 Right now one of the most popular of the Classic layouts is Chuck Yungkurth’s Gum Stump & Snowshoe Railroad that dates from the 1950s. I’ve seen a lot of variations on this excellent switchback layout and even published a special issue, #38a, devoted to Gumstumping. For me one of the most exciting offshoots was the opportunity to visit the Cass Scenic Railroad in the mountains of West Virginia USA. It’s a Shay powered, former lumber line that uses switchbacks and 11% grades to climb Bald Mountain. It’s Gumstumping in 1:1 scale! I visited Cass recently with a group of photographer friends. One of them, Tippi Comden, has made a six-minute video of the ride, including the switchbacks, which is exciting to watch. You can view it here (be sure to turn up your Sound!). I’m especially happy with prototype scenes and situations that, like Cass, are readily adaptable to small-layout designs. A number of them appear in the Scrapbook, and I’d like to see more. The ones that appealed most to me were Norddeich Mole, a north German ferry station (#32); Luxembourg Central Station with a built-in Inglenook pattern (#46); and the nostalgic Vicenza-Noventa tramline in Italy (#49a). As always, you might well select different examples! Returning to models, I’m always delighted to see small layouts that are built in unusual containers. We’ve featured “containerized” layouts often in these pages (notably in #34 and #38). Examples that stick in my mind are a Gn15 layout built in an old microwave oven (#31) and a dual gauge On30 and On18 [O16.5 and O9] layout built on a sink knockout removed from a new kitchen countertop (#11). But I guess my favorites (or favourites) are the shoebox layouts. I dreamed up this idea in 2002 with Carl’s Imports, featured in the Design Gallery. The idea has caught on, been published here (and in #28, #35, #36, #42a). There have even been contests for shoebox pikes, like the one at the 2004 ExpoNG exhibition in Kent, England. It’s hard to believe that so much railroading can be squeezed into a space the size of a shoebox! Keep ‘em coming! And I’m always excited to see the excellent scenic treatments that many contributors build into their small layouts. Examples abound throughout all 60 issues, and selecting a few to mention is in no way intended to diminish the excellence of the others. The ones that I particularly remember were Petroc (#22), Arne Wharf (#25), Bewdley Brick CompanyTram (#44a), and Draversaz (#45a). And there are many more! Finally, I will end with an announcement. So many excellent and original materials have appeared in these pages that they cried out for a new book publication. So I have put together my third book. It’s being released effective today (1 June 2006), and the title is “Carl Arendt’s Small Layout Scrapbook” (what else?). It’s a thick book, chock full of the best from this Scrapbook and much, much more. I’m very proud of it. If you’re interested, you can read all about it here. So here’s wishing us all exciting journeys on small layouts during the next 50 issues of the Small Layout Scrapbook! We’ll be back to our normal format next month.